Points Needed: 4750 Software is not compatible with mobile and tablet devices. Please add this title to your Wish List and sign on to your the first club account from a desktop computer to complete your redemption. 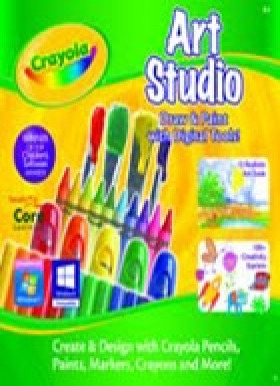 ABOUT THE SOFTWARECrayola® Art Studio - Create and Design with Crayola Paints, Markers, Crayons and More!Crayola® Art Studio is an award-winning art program with an excellent set of draw and paint tools designed for children of all ages and abilities. Create original artwork using twelve realistic digital art tools that imitate real Crayola art supplies including crayons, pencils, markers, tempe… ra paint, watercolor, and chalk. The program is touch and pressure-sensitive and enabled for touch screens. With sixteen adjustable shape tools, a variety of motif designs to quickly create complex patterns, endless undo and redo tools, and symmetry tools that easily create proportional images, this amazing art software provides endless creative possibilities. Choose from hundreds of preconfigured colors in the color chooser or mix original colors using a digital palette. Learn to edit and transform digital images with hundreds of Crayola creativity starters, including backgrounds, borders, art tools, and much more! The easy-to-use, customizable interface allows users to effortlessly explore digital art on an individualized basis. Crayola Art Studio comes with two preconfigured interfaces. The Begin to Draw level is for beginners and closely parallels the features of the Crayola Art Start program. The Art Studio level is easy to use for children of all abilities whether with creating art or with computers. Make invitations, decorations, and greeting cards or add artwork and images to projects. The program is supported by a Program Tour, a User manual and an Activity Guide. With the Activity Guide, children learn the principles of artistic design. Crayola Art Studio is the winner of the NAPPA Gold award in the Software and Video category from the National Parenting Publications Awards (NAPPA) Children’s Products Competition, Silver Honors from the Parent’s Choice Foundation and a runner up in the Best Educational Software category by the Association of Educational Publishers (AEP). KEY FEATURESBenefits: Fun and easy to use, these art tools inspire creative expression without boundaries The best drawing and painting program for children at a great price Supported by hundreds of special Crayola® art images Children learn key art and computer skills Fun for all family members Features: 12 realistic art tools including tempera paint, acrylic paint, watercolor, chalk, crayon, oil pastel, colored pencil, marker and more Select from hundreds of pre-set colors or mix unique colors on digital palettes Easy-to-use complete range of drawing tools Progressive undo and redo features support experimentation Several Hundred editable art images to supplement artwork and learn digital editing techniques Customize the interface with selections of backgrounds, icon sizes and tool configurations A special Begin to draw level helps beginners learn basic computer drawing skills The software is pressure-sensitive when used with a mouse pen or stylus that is enabled for pressure-sensitivitySYSTEM REQUIREMENTS OS:Windows 8, 7, Windows Vista, and XP.